2 in 3 Americans spend more on toys then school supplies, with no plans to change their budget. 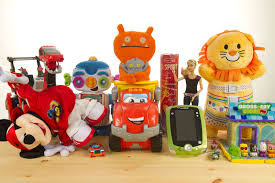 The word "toy" comes from an Old English word meaning "tool". Slinky was invented in 1945 by Marine Engineer, Neil Tollotson. On Sesame Street, Bert's fish were named Lyle and Talbot, presumably after the actor Lyle Talbot. The name "Crayola" means "Oily Chalk" in French from the combination of "craie" (chalk) and "oléagineuse" (oily). All G.I. Joe 12-inch action figures have a scar on their right cheek. They also have an inverted thumbnail on the inside of their left thumb in honor of a production error made years ago. G.I. Joe was inspired by a TV show called "The Lieutenant" which was created by Gene Roddenberry, the creator of Star Trek. The star was Gary Lockwood, who would later guest star on Star Trek. Lockwoods character's middle name was "Tiberius" which was also James Kirks middle name. Some guest stars on The Lieutenant also included future Star Trek cast memebers Leonard Nimoy (Spock), Nichelle Nichols (Uhura), and Majel Barrett (Computer voice and several other characters as well as Gene Roddenberry's wife). The yo-yo is believed to be the second-oldest toy in the world. The name yo-yo comes from a Filipino expression meaning "come come". In 1985, Astronaut David Griggs used a Duncan Imperial Yo-yo on live TV from the deck of the Space Shuttle. Hasboro introduced a toy in 1962 called "Flubber" (tied to the movie "Son of Flubber"). It was made from synthetic rubber and mineral oil. Unfortunately, it made people sick. More than 1600 people developed sore throats, rashes and other reactions from contact with the stuff and Hasboro had to recall it. To get rid of it, they buried it and put a parking lot over it. According to legend, on hot summer days Flubber would ooze through the cracks in the pavement. From 1952 to 1963 parents had to supply real potatoes for the body of Mr. Potato Head, until 1964 when Hasboro introduced a hard plastic body. In 1987 Mr. Potato Head became the "spokespud" for the Great American Smokeout. He gave up his pipe to Surgeon General C. Everett Koop in Washington DC. What company makes more airplanes than Boeing? Answer: Spin Master. They've made 10 million planes since 1998. During World War II the U.S. Armed Forces commissioned ViewMaster reels for training purposes. Play-Doh was originally used to clean wallpaper. The ingredients are a secret. Lego's name comes from the Danish phrase "leg godt" ("play well"). The Lego Company is the world's biggest vehicle tire manufacturer producing 311 million tiny tires in 2001. A Chemical engineer named Neil Tollotson accidentally created Latex balloons while trying to make liquid rubber. There have been five billion Monopoly houses built since 1935. The record for playing Monopoly underwater is 1,080 hours. Parker Brothers rejected the game of Monopoly citing 52 fundamental playing flaws. The character locked up in the jail in Monopoly is "Jake the Jailbird". Officer Edgar Mallory put him away. Hasbro was founded in 1923 in Providence, RI and sold textile remnants and later manufactured pencil boxes covered with them. Mattel began in 1945 by producing picture frames and miniature furniture made of polyurethane left over from the manufacturer of airplane nose cones. Kenner started in 1947 making soap and soft-drinks.